This was a special program that I did during the Summer of 2013 for “Dig Into Reading!” Families with kids ages 3-7 were invited to spend an afternoon celebrating all things construction! You really can never go wrong with a special version of Simon Says. I gave the kids construction hats that I bought for the program to wear while we played. I put mine down at one point and wound up sitting on it, smashing it. I’ve never seen preschoolers erupt in such laughter. The website linked above can give you full instructions, but basically I had two dump truck with packing peanuts that I had painted to look like rocks and two buckets. I divided the kids up into two teams and they raced to get their rocks from the trucks to the buckets. They had great fun with this one, even if I didn’t really “pronounce” a winner. Very simple way to hand out prizes. I had a bin full of shredded paper and let the kids dig using sandbox shovels for their ring pops. I figured that was as close to diamonds as I was gonna be able to afford! I got this craft from Kids Craft Weekly. I let the kids do their own cutting and I had plenty of parents around to help the youngest ones out. I did keep the hole punchers at a single table with the brads so that teen volunteers could help with the construction aspect. Did I mention the part where I sat on my hat? Basically, not even ring pops could compare with how awesome that moment was! Their favorite book was probably “Tip Tip Dig Dig” and they really liked that I used the same illustrations to make the flannelboard. The craft was definitely doable for the kids, but I had a few that struggled to use the scissors, which makes me all the more determined to give them more opportunities when possible! Put your Blue crayon in the air hold it high and leave it there. Now please lay it in your lap. Now please lay it on the floor. Hold your Blue crayon and jump, jump, jump. Hold your Blue crayon way, way up! Five little crayons, waiting in a row. The kids did crayon rubbings with our rubbing plates. I totally didn’t take any pictures and feel awful about it! My Friday morning group loved the flannelboard rhyme best. Afterwards, I turned the board around and took a color off, letting them guess what I had taken. There was a lot of gleeful screaming. Their favorite book was “Go to Bed, Monster” since I had perfected my monster voice by the second storytime! 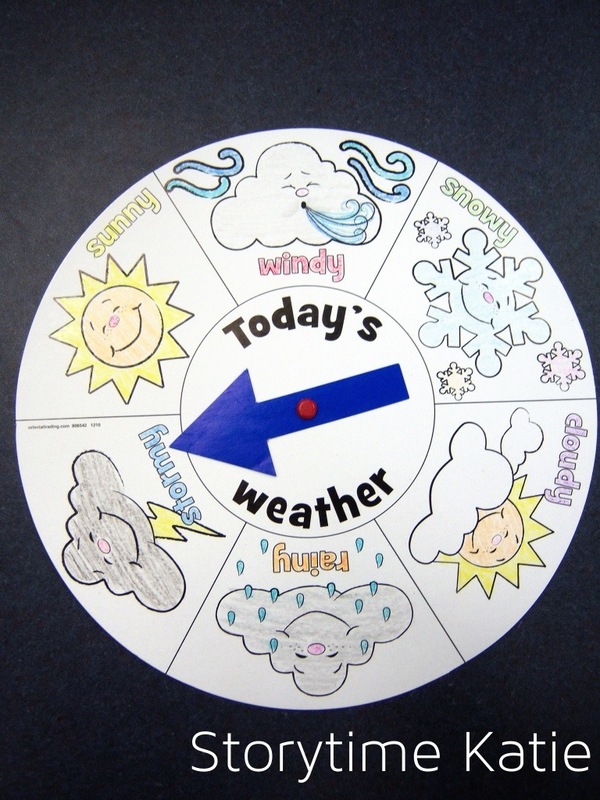 This was a weather wheel craft from Oriental Trading. I did a similar version of it for my outreach storytimes in Letter W, but went ahead and ordered this one for the library. Overall, I probably should have just made the teen volunteers cut another set of the homemade version since I think it went over better. This storytime was months and months ago at this point, but I realized that I had never written it up! This was my first time using the iPad in regular morning storytime, and it was pretty awesome to see the kids interacting with the Kid Weather app. All of the extension activities were super fun, and Maisy’s Wonderful Weather book was everyone’s favorite since it’s a pop-up. My flannelboards for this session were purchased boards, which you can still buy online at Amazon. I put up each season as a lead-in to the books that I choose and let the kids tell me what we did in that season as I put up the flannel pieces. Then “whooo” went the wind and out went the lights. This was a purchased Oriental Trading craft kit. Honestly, it was too much coloring for my littlest patrons. But my preschoolers were determined to color every inch of space on these! This was another one of those storytimes where attendance was SO LOW and it turned out to be a storytime for only six kids. I wound up cutting out a lot of extension activities that I had planned and instead just read books and had great conversations via the flannelboards. This month, I was very excited to be able to do a Maisy themed program for my 3 to 7-year-old age group. The kids at my library are crazy about Maisy, and her books are rarely on the shelf. I knew that this would be a successful program, and was pleased that I could devote a whole hour to one of their favorite characters. I began storytime by laying down expectations for kids and parents — something new I’m trying to see if we have some better behavior. (Which we totally did!) And then, went ahead and read “Maisy Goes On Vacation” by Lucy Cousins. This is one of those “First Experience” books, so it walks Maisy through packing, getting to the beach, and her first day on vacation. I love the Maisy “First Experience” books because they do such a good job of explaining these new places and activities to preschoolers. After we finished this book, the kids had a lively discussion of where they had each gone on their last vacation. Super cute. Next up, “Maisy Big, Maisy Small” by Lucy Cousins. Introducing this book was SO easy, because the kids had seen the cover of this book in the last one. (Maisy reads one of her own books on the way to her vacation.) The kids were pumped that we had Maisy’s book here! This tale of opposites led to a lot of laughter with the kids, especially the “Maisy fluffy and Maisy spiky” page layout. Afterwards, I asked the kids about what kind of animals Maisy and her friends were. They kept telling me that Maisy was a mouse, but I had one little girl rattle off the other animals (crocodile, elephant, etc.) very proudly. I asked if Maisy had any fish friends, and the kids shook their heads, and that led us into “Maisy Goes to the Library” by Lucy Cousins, where Maisy searches for a fish book. Then, our next story, “Maisy Cleans Up” by Lucy Cousins. He’s been there for a week. I heard he had a twin. This was by far one of my favorite fingerplays ever. The kids were so happy to bounce their finger-mouse up and down, and we had a lot of gigglers. And a couple of them picked up the chorus by the end of the chant! And to finish up, our grand finale was “Maisy’s Show” by Lucy Cousins. My co-workers tease me about how much I enjoy pop-up books that don’t require you to fix the pop-up before moving on. This book is easily my new favorite pop-up book! The actions are thoughtful and appropriate, the kids are wow-ed by them, and I don’t have to fix the book before turning the page! Lastly, the kids played a quick game of “Pin the Tail on Maisy” that I printed off from the official Maisy website. Followed by a quick craft of making Maisy ears (also on the official site) and a puppet coloring craft of Maisy riding a bicycle. A hugely successful program, with no headaches, and a great afternoon spent at the library.